DHT stands for "Distributed Hash Table". This is a system to find other peers without the use of a tracker. It is not necessary to use the DHT feature, but it can sometimes be useful when trackers have failed or are unreliable. The top frame in this view shows a general status and the local node ID. If the general status shows "port unconfirmed", it means no remote messages have been received and incoming packets may be blocked by a firewall. If this is the case, please refer to step 3 in the Tixati Optimizing Guide for more information. 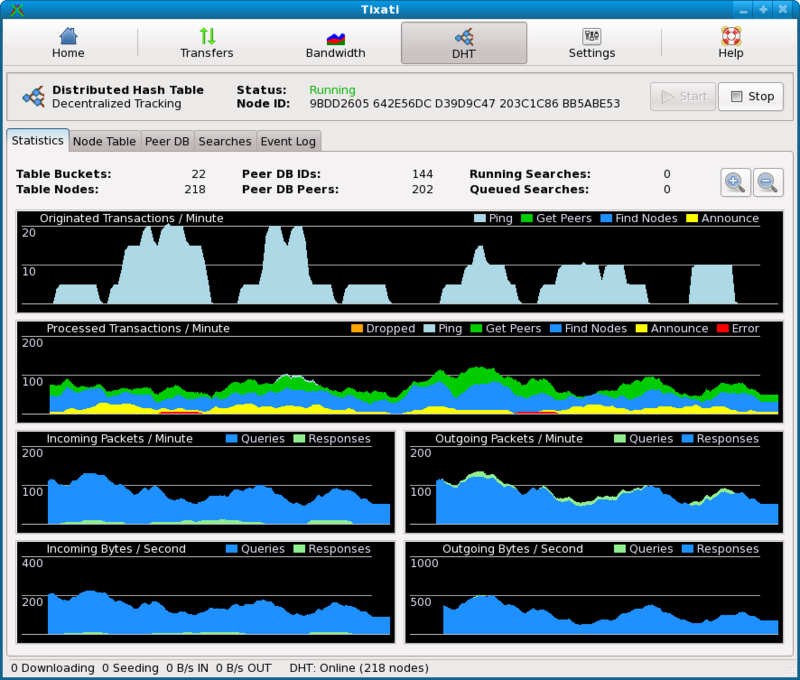 This shows general DHT statistics such as packet traffic rates, request rates, and bandwidth usage. Here all the cached DHT remote nodes can be viewed. A healthy table usually has 15-25 buckets, each containing 3-30 nodes. These nodes are used as the first-step in outgoing searches for peers for a particular transfer, and are returned in response to incoming searches for nodes. These are all the peers that have registered with the local peer database. A peer will register itself when the hash-id of the transfer it is participating in is numerically close to the local Node ID. This will show all active outgoing searches for peers, as well as the nodes used in the search. A particular transfer can be forced to make a DHT search by right clicking that transfer and selecting 'DHT Search' or by pressing a button in the DHT section of the Transfer - Properties window. Note that transfers will automatically initiate DHT searches at regular intervals, so forcing one is seldom needed. This shows a log of events, such as searches, node-table refills, and node-id changes. The detail level may be adjusted to show individual messages to and from other DHT nodes, although this is not recommended because logging each message will consume many lines and cause elevated CPU usage.